This 2.5-hour shore excursion from Ketchikan port gives you bird's-eye views of Tongass National Forest aboard a Havilland Beaver floatplane before it lands at Revillagigedo Island’s secluded George Inlet Lodge. Settle in for a sumptuous Dungeness crab feast in an ocean-side dining room, shop for souvenirs and then relax on a scenic drive along the island’s coast back to Ketchikan. Enjoy a memorable experience on this small-group tour limited to just 12 passengers. During your cruise stop in Ketchikan, pair a floatplane ride with a crab feast for a quintessential Alaskan experience. 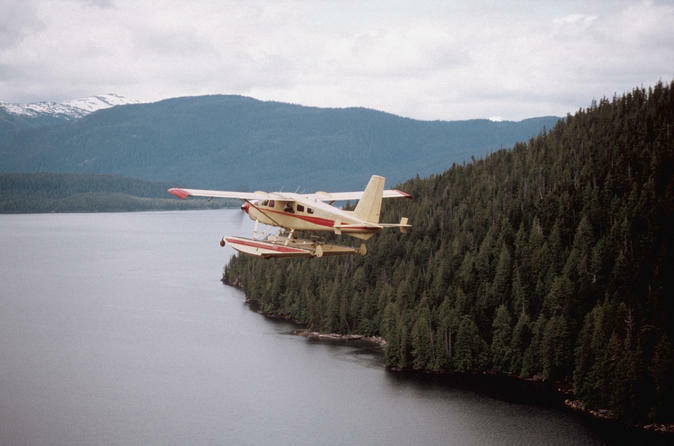 From the port, head over to the Visitors Center and then step aboard a Havilland Beaver floatplane, which was only produced from 1947 to 1967. Lift off from Tongass Narrows, a Y-shaped stretch of water between Ketchikan and Gravina Island. For approx. 20 minutes, soak up views of Tongass National Forest while your pilot points out key landmarks below and shares facts about the Alaskan wilderness. Enjoy a smooth landing at the George Inlet Lodge on Revillagigedo Island. You’re welcomed right away with a sample of smoked salmon before you tour the grounds with a guide, who explains the lodge’s beginnings and Alaska’s crab industry. Then, settle into a dining room with water views and indulge in a finger-licking Dungeness crab meal with all the fixings, including steamed red potatoes, romaine salad and more. Remember to save space for dessert, cheesecake with Alaskan blueberry sauce! Afterward, pick up souvenirs in the gift shop and board a minivan for the ride back to Ketchikan. Learn about the fish hatchery, a Coast Guard station and totem poles that you’ll pass during the pleasant 30-minute narrated drive.